This retreat is currently sold out, please send us an email to be on the waitlist! Retreat with Wild Vibes for an 8 day immersion into holistic wellness, culture, and adventure to Bali, Indonesia, known as the island of the Gods, from May 5th - 12th, 2019. 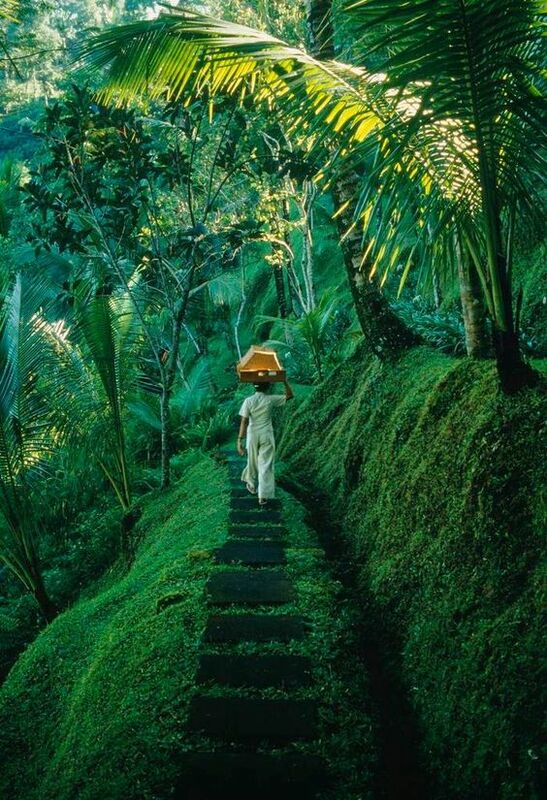 Bali is a place near and dear to our hearts. It’s rich in ritual and captivating energy. Abundant in vitality and bountiful of beauty, the island is soaked in wisdom and wonder. You feel it in the genuine smiles and daily offerings that fill the eclectic streets, you hear it among the stillness within the awakening sounds of a new day, and you see it within the vibrant green rice terraces, monkeys playing, and in a pastel-colored sunset setting over the waves. With an inviting culture and vibrant way of life - Bali has a magic that’s hard to put into words. This uniquely crafted retreat blends cultural immersions and adventure excursions, with wellness practices designed to help you learn, grow, and transcend. 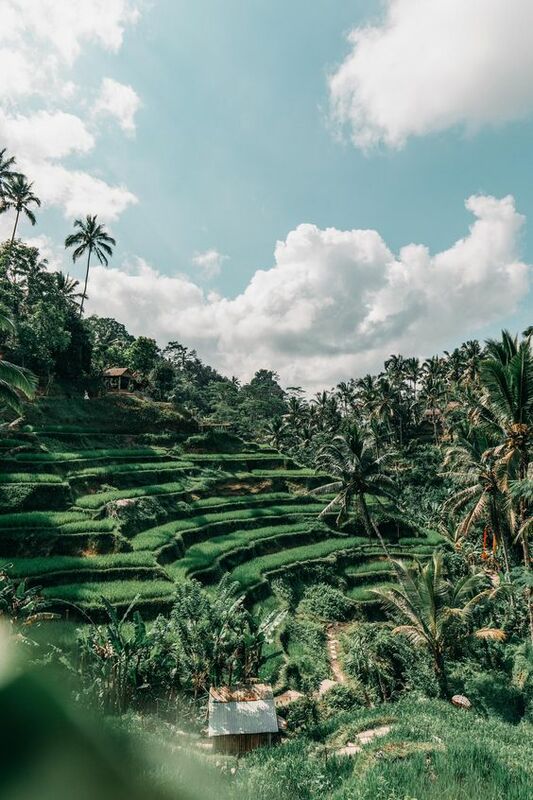 We'll practice yoga among rice paddies and lush jungle greens, experience authentic Balinese culture, trek a volcano at sunrise, explore the stunning beaches and surrounding islands, and relax and recharge in one of the most healing and mystical places on earth. Eat nourishing meals, stay in eco-luxury accommodation, and be a part of this one of a kind, community driven experience, where we’ll explore and discover a deep connection to the world and within. In the place between heaven and earth and in the middle of rice paddies, you’ll be staying at the Blue Karma Resort in Ubud, often described as the cultural heart of Bali. Surrounded by lush, exotic greenery, and just 3.5KM from the eclectic city center that’s filled with bustling markets, a monkey forest, and plenty of vegetarian restaurants, Blue Karma will be our home to relax and let go for the week. At the resort, you’ll find several places - like a 25m pool and sacred spaces to receive a traditional Balinese massage, to rejuvenate your body, mind, and heart. We’ll practice and connect together in the beautiful Karma Yoga pagoda to the sound of running water, singing birds, and rustling jungle palms. Private and shared accommodation available. 7 nights, 8 day stay at the beautiful Blue Karma Resort— shared or private accommodation. Complimentary wifi, daily bottled water, and welcome drink upon arrival! Access to Blue Karma Facilities & Traditional Balinese Classes - enjoy access to Blue Karma’s gorgeous facilities - including a pool and unique spaces to receive massages and treatments on site; daily guided treks into Ubud through rice paddies and jungle; complimentary Balinese traditional ceremonies such as Boreh -ancestral warming balm herbal preparation and Jamu -traditional curcuma healing drink classes. and specialized workshops. All Yoga equipment provided. Enjoy a hot drink and healthy snack after classes. One of a kind Experience - Community, connection, & fun! 7:30 AM Coconuts & Coffee. Morning Meditation & Journal. DAY FREE: Group Excursion and/or time to explore, hike to waterfalls, swim, shop, relax, etc. * all sessions are encouraged but optional! Schedule is subject to change, and will vary slightly based on offerings and excursions. 1) STEP ONE: Fill out the booking form by clicking the button below! 2) STEP TWO: After your booking form submission, expect a response from your Wild Vibes Retreat leader within 24-48 hours, who will further assist you with finalizing your booking. 3) STEP THREE: Choose your accommodation and reserve your spot by paying the deposit online (please note a $20.00 credit card transaction fee), or to Venmo at @ajgovoni. Once we receive your deposit on your room choice, your room will be reserved! (please ask about our payment plans!). 4) STEP FOUR: Book your flight! We can help with this, so don’t hesitate to reach out! 5) STEP FIVE: Watch the facebook event for updates! 6) STEP SIX: Pay the full amount by March 15th. 7) STEP SEVEN: Expect countdown emails from us with updates on what to pack, what the week entails, transport info, and what you can expect! 8) STEP EIGHT: WE’LL SEE YOU IN BEAUTIFUL BALI!!! A 50% non-refundable deposit is required to hold your reservation ($20.00 credit card transaction fee -if you would like to avoid credit card fee, please deposit amount to venmo @ajgovoni). Final payment of $1,007.50 (includes $20.00 CC transaction fee) is due no later than March 15th 2019. Fill out the form below to be on the waitlist! Single twin, shared accommodation with private bath in eco-luxury suites. Fill out the form below to be placed on the waitlist! Private accommodation with private bath in eco-luxury suites. You must have a valid passport to travel to Bali. Please check your passport expiration date and make sure it is valid for the duration of this trip. A 30 day free visa is granted upon arrival for US Citizens visiting Indonesia. Check-in begins at 4:00PM, with the welcome gathering beginning at 5:30PM on Sunday, May, 5th. You will fly in and out of Ngurah Rai International Airport, also known as Denpasar Airport (DPS)- about an hour away from Blue Karma Resort. We recommend using SKYSCANNER to find the best flight deals, and we are happy to help you with finding and booking your flights. Going on a retreat is a really supportive, and amazing way to travel outside the country on your own. You will be surrounded by a group of like-minded people that will end up becoming some of your closest friends. If you are traveling alone, we can happily pair you up with another guest to share a room. We host so many solo retreaters, it's a really lovely way to meet new people! If you are traveling with a friend, or there is someone specific you want to share a room with, please let us know and we can make arrangements! We’ll have two nourishing meals a day together as a group — breakfast & dinners. Most meals will be vegetarian and can be catered to dietary needs upon requests, please make sure to let us know your preferences and needs in the booking form. We will be having 1-2 meals out for a fun dining experience. Our midday schedule is open for you to explore waterfalls, take a beach trip, visit the monkey forest, etc, so lunches will be on your own! (there is a restaurant on site and AMAZING restaurants and cafes in UBUD - plus you just can’t beat the abundance of fresh fruits and cheap Indonesian cuisine all around!). We are open to discussing ways to make our retreats accessible to you! Please contact us directly if you would like to see how we can make this retreat work for you through payment plan options. All Wild Vibes Retreats deposits and payments are non-refundable. We highly recommend purchasing travel insurance for your trip, which will protect against emergencies, illness, cancellations, etc. We recommend checking out www.worldnomads.com. Thank you! Look out for an email within 72 hours with more details on the Wild Vibes Retreat to Bali!